Yes, you have read that correctly: a 3 for 1 deal.. and I am not going to lie, this is extremely cutesy and girly and lovely. I pinned a photo of this POST from Neverland Nail Blog - and I think she got it from somewhere else.. and.. well, where ever this did originate from - you're a genius! I loved the purple.. and I happen to have a lovely lilac purple to use from my untrieds.. but I didn't have any purple glitter (that I felt was good enough to use)..
As I was perusing what I could use.. I spotted Essie Fiji.. Yup, I wanted to use that adorable pink. Sitting close by was NYX Dynamic Glitter.. Hey, awesome! I will do another glitter accent mani - nbD - two birds, one stone. I was jazzed about life. Then I was scrolling through pinterest.. saw the mani again and I thought.. why not do it with the pinks?! AND GET STAR GLITTER FROM WnW STARS & STRIPES! kjhbkxjdgfhkdjg.. I have momentary spells of genius-dome. I did 3 thin coats of Fiji, then I used one of my trusty little brushes to do some "swipes" of Dynamic Glitter, then I used a dotting tool to pick up just the stars from Stars & Stripes. Perfection. I abso-freaking-lutely love these! It is going to be a sad day for baseball when I have to change things up tomorrow. Le sigh. Thems the breaks, right? Remember to scope out Silver's BLOG to see what she has posted up for today!! P.S - This is my 300th post. 300th!! Yay!! 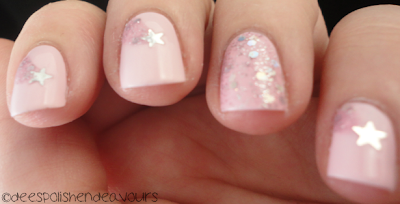 This mani is absolutley pure awesomeness!! 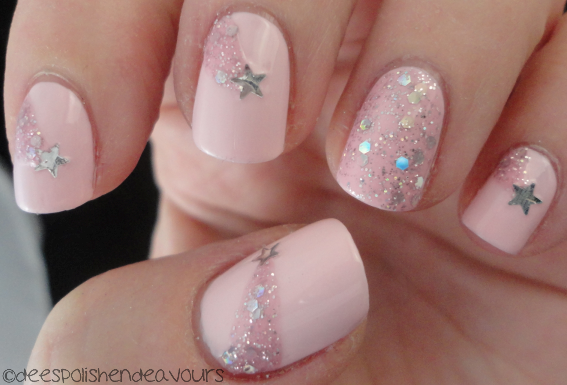 Sweetest mani ever! Love the color and glitter!